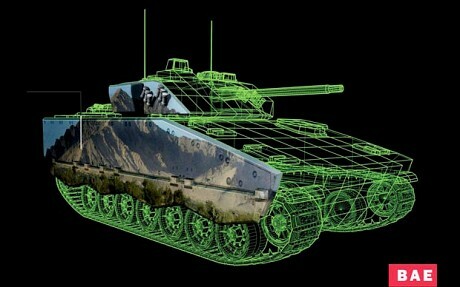 An e-camouflage technology developed by BAE Systems may be able to make objects the size of a tank invisible. Highly sophisticated electronic sensors attached to the tank's hull will project images of the surrounding environment back onto the outside of the vehicle enabling it to merge into the landscape and evade attack. The electronic camouflage will enable the vehicle to blend into the surrounding countryside in much the same way that a squid uses ink to help as a disguise. Unlike conventional forms of camouflage, the images on the hull would change in concert with the changing environment always insuring that the vehicle remains disguised. 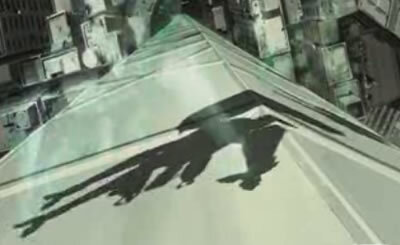 Fans of The Ghost in the Shell remember Tachikoma spider tanks that had special thermo-optical active camouflage; all that is left of the tank in the picture below is its shadow.